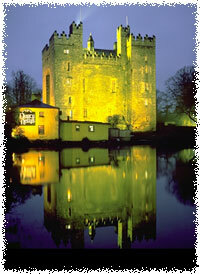 Bunratty Castle is one of the finest surviving examples of an Irish tower house. Although it is hard to believe that the castle has had a bloody and violent history. Its strategic position on the river Shannon made it the centre of many a battle, and it has it has been destroyed and re-built on at least eight occasions. Stone castles were first built by the Normans who guarded their territory from a structure known as a "motte and bailey" - a watch tower on a artificial hill, surrounded by a stockade. The Irish chieftains soon copied this means of defence, particularly during the 15th century when there were over 80 tower houses in the baronies of Bunratty and Tulla. The Castle is a cross between the earlier Norman Castles and later Gaelic tower houses. It is a rectangular tower with three main floors and four, six-storey corner turrets. It has been furnished with the finest collection of Medieval furniture in the country, thus preserving a vital part of the Celtic heritage. The Park is a living museum : animals are tended, bread is baked, milk is churned, walls are whitewashed and roofs are thatched. You may visit an Irish farmhouse, watch the blacksmith fit a horseshoe, attend a weaving demonstration, and bake and eat scones at the local tea house. The village also reflects the fundamental changes that led to increased mobility. FREE preparatory visit for teachers. Detailed teachers notes and student worksheets are available. An Education Officer is on site and there are classroom and audio-visual facilities. Guided tours and active workshops in French, English and German organised on request. Topics which might be discussed beforehand in the classroom are the history of castle building and architecture, Medieval furniture and artwork, sieges and warfare, feudal dominance and the Gaelic resurgence, and the social history and heritage of Ireland. The Folk Park examines domestic chores and life, social status, food, trade, and craft activities. Schools can also participate through the Arts Education Centre in the "Story" project. This is an international cross-curricular project, involving students in a series of heritage-based projects. In some cases, an exchange program can be developed with other schools in Ireland to compare the history and heritage of the participants. For more details, contact the Education Department. Groups can also participate in the Bunratty Medieval Banquets or dance and listen to stories and music at the local "Ceili", held in the biggest barn in the district.